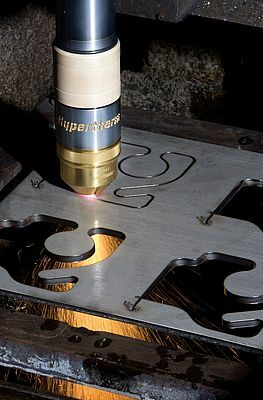 Most recently Hypertherm introduced the HDi technology for thin stainless steel applications. The metal cutting HDi for HPRXD systems brings HyDefinition plasma technology to the thin stainless range, aiming at setting new standards in cut quality, cut speed and consumable life. The company also launched the MAXPRO200, a new 200 AMP, single button operated cutting and gouging system that can be used in both handheld as mechanized applications. A production pierce capacity on mild steel of 32 mm and a severance capacity of 75 mm can be achieved. Furthermore, the supplier integrated its bevel expertise into the ProNest 2012 version of CAM Solutions, making bevel capabilities available to HPRXD users. Like True Hole and Rapid Part, Bevel Technology is part of the company's integrated cutting solutions to help focus on business goals by making it easy to take care of metal-cutting needs.